On Sale Now! 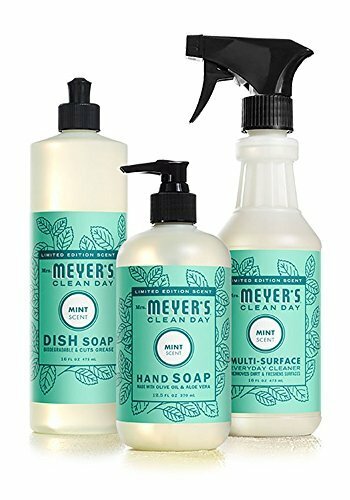 Save 9% on the Mrs. Meyer's Clean Day Mint Kitchen Basics Set Limited Spring Edition 3 items - (1) Dish Soap, (1) Hand Soap, (1) Everyday Cleaner by Mrs. Meyer's Clean Day at KXSH 365. Hurry! Limited time offer. Offer valid only while supplies last. The Mrs. Meyer's Clean Day Mint Kitchen Basics Set is an easy way to introduce a friend (or yourself) to our Mint-scented, trusted kitchen cleaners! The Mrs. Meyer's Clean Day Mint Kitchen Basics Set is an easy way to introduce a friend (or yourself) to our Mint-scented, trusted kitchen cleaners! The set contains our favorite Mint cleaners, including Liquid Dish Soap, Multi-Surface Everyday Cleaner and Liquid Hand Soap. Ingredients are at least 97% naturally derived. Set includes Mint liquid dish soap, Mint multi-surface everyday cleaner and Mint liquid hand soap. Ingredients are at least 97 percent naturally derived! Dish soap is biodegradeable and cuts grease. Hand Soap made with Olive Oil and Aloe Vera. Everyday cleaner Removes Dirt and Freshens Surfaces! The Mrs. Meyer's Clean Day Mint Kitchen Basics Set is an easy way to introduce to a friend (or yourself) to our Mint-scented, trusted kitchen cleaners!